Though one of the greatest joys in the world, being a parent can be exhausting and overwhelming. You’re now on-call 24/7 to care for the needs of this little person. But, a bit of preparation can go a long way in helping you respond to your baby’s needs (and your own). Your Shoppers Drug Mart pharmacist will gladly assist you as you stock up your medicine cabinet with remedies, supplies and medications for those just-in-case moments. When it comes to coping with the flu, you’ll want to keep infant Acetaminophen or Ibuprofen on hand to help bring down a fever and relieve pain. Electrolyte solutions, like Life Brand Enhanced H20 Electrolyte Water, can be used to treat dehydration if baby is suffering from vomiting or diarrhea. Also, Life Brand offers a variety of digital thermometers—a must-have to help monitor your little one’s body temperature. No one likes getting a cold, especially a baby. To help relieve congestion consider running a cold air humidifier in baby’s room, use a nasal aspirator and saline drops to clear the nose and apply a layer of non-mentholated Vicks BabyRub ointment to help soothe and relax your child for sleep. 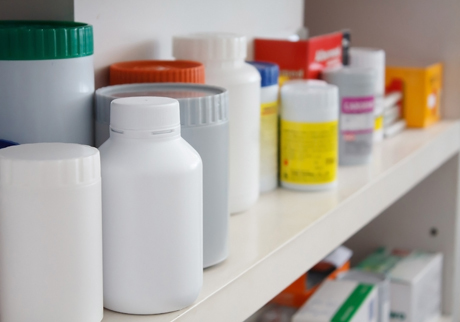 A well-equipped medicine cabinet will always include supplies needed to clean a scrape and soothe a bump or bruise. Especially as baby learns to walk, these remedies will hopefully keep tears to a minimum. An antibacterial ointment like Polysporin® for kids is a must-have, followed by a package of adhesive bandages (the more colourful the better). Cotton swabs, a bottle of rubbing alcohol, mild liquid soap and an instant cold pack round off this mini first-aid kit. Finally, there are few things mom and dad might need. These include adult strength Life Brand Acetaminophen and Ibuprofen, a multivitamin to supplement a healthy diet, Life Brand Cold Assist to keep immunity up and a heating pad and muscle rub to relax strained muscles after a day of chasing baby around. Peek inside mommy and daddy’s medicine cabinet. Take this list with you to Shoppers Drug Mart to ensure your home is well-equipped with everything you and baby might need. Life Brand Cold Assist to stave off cold and flu season. A hydraSense® nasal aspirator and saline drops for baby. A Life Brand digital thermometer. Infants’ Tylenol® drops or Advil® pediatric drops for infants (up to three years). One pack of Baby Life ultra- soft baby wipes. One pack of Baby Life Safety cotton swabs. A tube of Zinc Oxide cream such as Baby Life Daily Protection Diaper Ointment or Aveeno Soothing Relief Diaper Rash Cream. A pair of tweezers to remove splinters. A tub of Baby Life Petroleum Jelly Unscented to be used for chapped lips or as a lubricant for a rectal thermometer. Aveeno® Baby Soothing Relief Moisture Cream for dry or irritated skin. Baby Life unscented, hypoallergenic Baby Oil. Baby Orajel® for teething pain.